Kat's 9 Lives: All I Can Say Is... Heavenly! Finally! After the long wait, we finally went to Sushi Sam's for dinner! 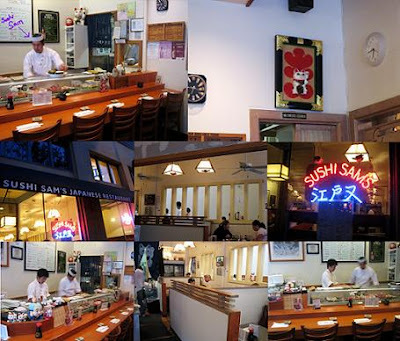 It's a great sushi place that's even comparable to the top sushi places in New York. I trained down to Hillsdale because I missed the train to San Mateo, BOO >_<#. We drove locally to San Mateo and arrived later than we planned. Luckily the sushi bar was still empty when we arrived, but soon after it began to fill up quickly. You will see that Sushi Sam is always there working hard and diligently behind the sushi bar. You've got to love that! Word to the wise, DO NOT SIT ANYWHERE OTHER THAN THE SUSHI BAR!!! One time we came and there was a huge party sitting at the sushi bar, we opted to just sit in their dining room and that was the worst thing possible. I was so furious and disgusted by the food. It's a drastic difference from the wonders you are served at the sushi bar. The decor was your traditional sushi bar, clean with cute decors around. I just love the sushi clock by the sushi bar. Everything was a light wooden finish and their servers are always friendly. Mostly because they know Ms. Lin very well. We always come here to get their Omakase. To start off we ordered the 10 piece Omakase that came out in pairs. They always give an amuse bouche of some sort. This time it was tempura asparagus and a shrimp stuffed with egg yolk & mayonnaise. The asparagus what chopped up and fried in a clump. There was a crisp bite into it and the shrimp was light with flavor. It was a very unique start to the meal. The first plate of the night was Fresh Tako, Octopus, and Blue Shrimp. One sign of a great sushi place is that they must carry fresh wasabi or real wasabi that's not paste. The Tako was very fresh and drizzle with salt, lemon, & more. It was a bit on the chewier side for me, but it was fresh. I don't like fishes that have a chewy texture. The shrimp was good and fresh. It's not as sweet as Amaebi, but I still like the flavor. There was also components added to bring out the flavor of the shrimp. The best part was when they brought out the fried shrimp heads and we asked them to add ponzu. It was delicious, flavorful, and a perfect crunchy texture. Next came the Yellow Jack and Butter Fish. The yellow jack was just like the amber jack. It was fresh and tasty with the fresh wasabi. I felt that the yellow jack had a less chewy texture than an amber jack would. Either way I love all types of Yellow Tail. At first I thought the butter fish wouldn't be that good because I have had a few times and I am usually not that impressed. There was ground daikon, fresh onions, and soy sauce atop the butter fish. The fish's texture was softer than I thought it would be and the flavors went well. The next plate was Wild Black Sea Bass and Fresh Bonito. I like how they do their sea bass with the black seaweed. It adds a great crunchy texture to the fish. Sea bass normally has a slight chewier texture, but the seaweeds take away the focus and makes it much more delectable. 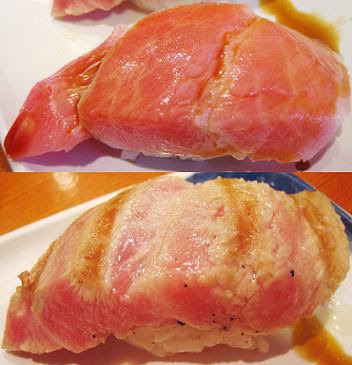 The fresh bonito looked almost like normal Maguro, which was not surprising since they are all types of tuna. The ponzu and fresh white onions atop the bonito only adds flavor along with the wasabi. I really liked the super soft texture that the fresh bonito had today. Nooooo... the end was near! If only money wasn't an object, I would eat until I burst! O=) The last plate was the Baby Lobster and Japanese Eel. It was kind of anti-climatic because after toro, NOTHING can be better. Yum Yum! The baby lobster was a good size and topped with mayonnaise with Roe & almond slivers. It was good, but nothing special. The Japanese eel was good, but also nothing out of the ordinary. Personally, I'd rather have a nicely broiled Unagi. Instead of trusting the chef's choice, Ms. Lin and I decided to order off the specials to our own liking. We both agreed on the Alfonsino, which I accidentally mixed up with Tasmanian Trout. Still, the fish was fresh and tasty with ground daikon, fresh onions, & ponzu. I also wanted to get the White Salmon. Unfortunately I forgot what it was like last time I was up here. The fish was drenched in Sesame Oil and fresh onions. For me it was way too salty, which took away from the whole flavor of the fish. Don't get me wrong, I LOVE sesame oil but it was so overpowering with the saltiness that you couldn't taste the fish. I must make a mental note for next time to stop picking this dish. O=P It's great for anyone out there who loves salty and the flavor of sesame oil. Ms. Lin wanted the Arctic Char so we ordered a piece each. The fish really resembled salmon. It had a slight chewier texture than salmon, but not that much more. It was good and fresh. The cut was generous too. My FAVORITE thing about Sushi Sam's is their Special Toro Hand Roll. This was the first place I've seen it done this way. They chop up tons of toro and add slices of Shiso & crunchy yellow pickles. All the components give the roll a special flavor that's only enhanced by the crunchy texture. It's so delicious in every aspect that I am starting to *drool drool* as I type. Can you see the drool puddles? =9 YUM YUM! It took all the powers in the world for me to not eat more than two hand rolls! Another favorite of ours was toro nigiri. Ms. Lin and I like it prepared differently. She loves the way that Sushi Sam sears it with lemon & pepper. 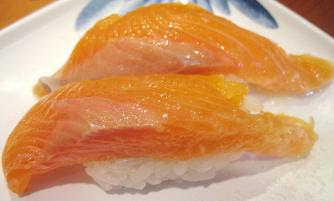 I just love the simple fresh toro topped with Yuzu, of course I had to ask for it to make it even better! ^_^ They had an awesome piece of toro atop the counter and they cut huge slices for every order. I was sitting there watching with my eyes wide open! We both loved the piece we got. That toro was perfection. The texture was superb and marbleized splendidly. *drool drool* After that yummy piece I ordered one more order of toro, but how should it be prepared!?!? I told Ms. Lin that it was like Sophie's Choice! She almost spit out her green tea, but she reminded me that in the end her revelation was that she shouldn't have made a choice and left them both. I told her heck no, I want both! We jokingly argued about it and I told her that I have the option to keep ordering more, but the difficulty of the decision was like Sophie's Choice. Can you tell how much toro means to me??? Definitely more than what she had to choose. =P I LOVE toro! Daisuki! The omakase comes with dessert and we decided to try their seasonal dessert even though they were a little odd... One was the Fava Bean Dacquoise. It's rosemary parfait with chocolate crisp, fava bean ricotta cream, rosemary cacao sauce, and sea salt. I have to tell you I find this very weird. My choice was the Strawberry Tart. It's strawberry jam, custard cream, cake crumb almond, star anise strawberry jelly. This was not the first time I have seen people try to add star anise to fruits in desserts. You couldn't really taste the star anise so it wasn't anything unique or special, unlike what I had at Firefly. The tart was small and good. I actually really liked the shortbread-like crust and the custard was very light. As for the fava bean dessert, well I don't like fava beans. I am not a fan of that gratey texture and flavor. Once you get past the beans, the ricotta reminded me of hummus in texture but sweet. I don't like rosemary when it's too overpowering, but you couldn't taste the rosemary that much. I really liked the chocolate crisp at the bottom and the dacquoise was good. All in all the dessert was inventive and had some good points. It was better than what I thought it would be. All in all the food is always great at the sushi bar. I always come here when I fly up to SF, it's a MUST! I've taken Burumun here, and she would agree that it's yummy! The only thing is money, money, MONEY... Their prices keep going up so it can be quite expensive, but I'd die happy! That's why I can only go to this place one time during my entire trip. If money wasn't an object, I'd live there! LOL The sushi bar has been consistently good and their service friendly. Don't give up waiting and sit in the dining room, it's COMPLETELY different. Trust me, the sushi bar's well worth the wait! If you can't get into the sushi bar, eat somewhere else in the neighborhood and come back another night for the sushi bar. Yes, it's that important! I LOVE SUSHI SAM!!!!! So jealous of your outing! The toro handroll is my absolute favorite - I almost always get it, along with the omakase of course. My sister and I got lucky one time and tasted homemade mochi with fresh strawberries inside, made by Sam's wife. It was unbelievable! Oooh Yummy Home-made mochi. That sounds great! For the record, I did ask Ms. Lin to invite you that night. Although everything was very last minute and I missed my train down to San Mateo. We were all flustered, but once we got there...our energy was purely focused on food! ^_^ Next time I am up we can go together again! I always go when I am up here. What is the pH of the American Oak Blend?